The Auto Levels tool analyzes the histogram and then adjusts the controls in the Exposure section to achieve a well-exposed image. It uses only the "Exposure compensation", "Highlight compression", "Highlight reconstruction", "Black", "Lightness" and "Contrast" sliders. Think of the adjustments Auto Levels comes up with as a good starting point. It has been tuned to work best with "typical shots", so the result should often be aesthetically pleasing, but as the program doesn't know your taste or expectations this will not always be the case. For example you might be going for a high-key look (i.e. not typical), in which case you should adjust the values yourself. You can reset all of the sliders in the Exposure section by clicking on the Reset button. The Tone Curves will not be touched. Auto Levels uses the "Clip %" value to adjust the exposure. This number defines the percentage of pixels allowed to clip to the white and black points of the raw histogram. The minimum value is 0.00, the maximum is 0.99. Higher values increase the contrast, lower decrease it. As of RawTherapee 5.5, while the Auto Levels tool in the Editor still uses the Clip % value, the thumbnails use a fixed value of 0.2% - this was done to reduce the number of files needed to be stored in the cache. Use Highlight Reconstruction (HR) to try to restore overexposed highlights in raw files. It attempts to restore clipped (blown-out) regions in the raw image relying on the fact that the three channels in a raw file do not clip at the same time and so a missing (clipped) region in one channel could be guessed from the present data of one of the other color channels. Using the Color Propagation method, it can also guess clipped data using nearby data from unclipped channels, if present. Remember, this tool is used for the reconstruction of clipped highlights, while if you just want to compress highlights which were not clipped in the first place but became clipped due to the use of, for example, Exposure Compensation, then use the Highlight Compression slider. The Auto Levels button will automatically enable Highlight Reconstruction if necessary. Recovered details will be neutral gray. "Highlight Compression" values under 100 are recommended in most cases. This is the most powerful recovery method. In addition to restoring luminosity, Color Propagation tries to restore color information by 'bleeding' the surrounding known color into the missing clipped area. This method works best on small overexposed areas, and can work wonders on overexposed skin. Its weakness is that it may sometimes 'bleed' the incorrect colors, depending on the image elements surrounding the blown highlights, or the colors can bleed into undesirable patterns. It is also computationally intensive and is therefore slower than the other methods. Works well even with very high "Highlight Compression" values (under 500). Reduces the luminance channel and tries to restore colors afterwards. Attempts to guess clipped color channels by filling in their values from the closest match from unclipped highlight regions nearby. The values of the Exposure Compensation slider (EC) are ISO values. This means a value of +1 equals one stop of overexposure (+1 EV, exposure value; also known as +1 LV, light value)). If you make two photos, one without correction (EV = 0) and one underexposed by one stop (EV = -1), you can make both photos match by setting exposure compensation for the overexposed photo to -1, or for the underexposed photo to +1. Take a look at the histogram while moving this slider. Moving it to the right shifts the whole histogram to the right. This means this slider changes the black point (on the very left of the histogram) and the white point (on the very right). If you try decreasing the exposure of a photo which contains clipping, you will notice that the clipped areas turn flat-gray. Enabling "Highlight Reconstruction" will prevent this flat-gray look to some degree by recovering highlight information from the remaining non-clipped channels. If you've used RawTherapee for a while you may notice that you almost always need a positive Exposure Compensation - as if all your photos are underexposed. Don’t worry - this is normal. Most cameras deliberately underexpose to preserve highlights (though some other raw processors disguise it). For the user interested in the internals follows a technical description of how EV=0 relates to the raw data: while EV=0 equals 1.0 in gain (that is, no change), there is a white balance dependent base gain applied before exposure. This base gain is calculated such that the color channel with the smallest range just can reach the maximum value. Although all raw channels have the same range in the raw file, white balance will re-balance them (lower temperatures mean more gain on red, higher more gain on blue) so they do not clip at the same level. The base gain raises the smallest channel just enough to make sure that at EV=0 no highlights will be based on clipped raw data. As white balance changes raw channel gains the base gain will thus change as a side effect when white balance is changed. For large white balance changes you may therefore see a slight change of brightness in the image. Note that the base gain relates to the maximum values channels can represent, that is if there is no highlight clipping in the raw file no highlight will reach the maximum level at EV=0. The Highlight Compression slider (HC) can be used to recover the highlights in a photo by compression, useful for 'dimming' (or burning) slightly overexposed areas. While the Highlight Reconstruction tool lets you try to reconstruct missing data in the raw file relying on the fact that the three channels in a raw file do not clip at the same time and so a missing (clipped) region in one channel could be guessed from the present data of one of the other color channels, this Highlight Compression tool only works on data which is already there - which has not been irreversibly lost at the time of shooting. If the original image has no clipping, but due to the action of, for example, exposure compensation you caused clipping, then you can use HC to compress these clipped regions back into view. As such, it works not only on raw files but on normal images too. To see if your photo contains overexposed areas, click on the clipped highlight indication icon on the top right of the image window. Overexposed areas will show up in black. An overexposed photo. No highlight compression, the clouds are clipped. The Clipped highlight indicator has been turned on to make the clipped areas easier to see. By dragging the Highlight Compression slider to the right, the intensity of the highlights will decrease. For highlight compression to work best you must also enable Highlight Reconstruction. Each of the HR methods has its strong and weak points, as explained above. Color Propagation is the most likely method to produce good-looking results when the HC slider is significantly over 100. For the other methods you will usually want to keep the HC slider around or below 100 - watch the histogram and the preview! A correctly compressed photo - the histogram touches both ends. To find out the optimal HC value, you can make use of the histogram. In the screenshots above, what you see are overexposed clouds above the Teide volcano in Tenerife. When hovering the mouse cursor over the overexposed area, the pixel values indicator (in the Navigator panel, under the little preview) shows that lightness (L) is at 100, and the histogram shows that all channels are clipped (see the red, green and blue squares in the top-right corner of the histogram, they mean that there are so many pixels of maximum value that they are off-scale). Increase the HC slider until the red, green and blue channels in the histogram no longer squash up against the right end of the histogram - you want them to touch it, but not to cram up against it. You can enable the Clipped highlight indication icon before moving the HC slider up. Once the indicator's black areas disappear from the white parts you want compressed, which is also when the lightness of those pixels drops from L=100 to L=99, you stop. Don't increase the HC slider any more, because now the hopelessly-lost white areas would start turning gray. You don't want them to turn gray. That would make the photo look dull. In this example the indicator's black areas disappeared when I set HC to 125. The histogram of an incorrectly processed photo. It should touch both ends instead of having gaps. As a rule, the histogram of a correctly developed image should touch both ends - the black and the white end. Not doing so means the image was incorrectly developed. This is true for the vast majority of photos, the only exceptions being photos of scenes which lack dynamic range, such as misty scenes. If you increase the HC slider too much, then whites turn gray as your histogram no longer touches the maximum end. Examples of photos that have been over-compressed can be easily found on the internet. They look horrible, don't do that! Recover what you can, but what's clipped beyond repair should stay white. RawTherapee offers more ways to deal with blown highlights. The side-effect of all these methods is that they also take away some of the brilliance of the photos, as they get more 'flat' or 'dull' as a result. Highlight compression is very useful when used with moderation, but remember that you cannot recover what is not there to begin with, so once you notice that the completely clipped white areas become gray you should reduce the compression amount until these areas become white once more. To create the best possible output, feed RawTherapee the best possible input - so expose well in the first place! The Highlight Compression Threshold slider sets the point where the HC slider starts implementing compression. A value of 0 means the threshold is zero: data compression occurs over the whole range of tonalities. 100 sets the threshold at one stop below the white point, so all the compressed highlights are squeezed into the top stop. In practical terms, more highlights are compressed when this slider is set to 0. Use this to set the black point. See the left side of the histogram move when you touch the slider. Values greater than 0 will make the image darker, negative values will lighten up the shadow parts of the photo. The Shadow Compression slider 'dampens' the effect of the Black slider. The maximum value of 100 gives a less dark image. This slider only has effect when the Black slider is set to a value other than 0. Practical use of this Shadow Compression slider is to fine-tune the shadow intensity of the image. This slider applies a hard-coded tone curve to lift or lower the tonalities of the photo, resulting in a more or less light image. The same tone curve is applied separately to each R, G and B channel. The black point and the white point keep their positions. This slider increases or reduces the contrast of the photo. It applies a contrast curve centered at the average luminance level. Tonalities above the average are lifted (lowered), while tonalities below the average are lowered (lifted). The same contrast curve is applied separately to each R, G and B channel. This slider makes the photo more or less saturated. In more technical terms, it adjusts the saturation of the image by applying a multiplier to the saturation level of pixels in the HSV color space. Here you can construct your own tone curves. They work on all three R, G and B channels at the same time (so you can't work on the R channel only). There are two tone curves available, which can be designed with various curve types, and applied in several different modes all explained below. Clicking on the curve button hides the curve from the interface - it does not disable the curve. 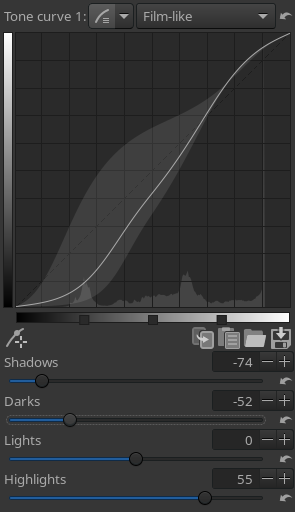 The histogram displayed as the curve's background shows you the levels of the data as it flows into the curve at that point in the processing pipeline. You will notice that it differs from the main histogram which shows you the levels of the final image, at the very end of the pipeline. 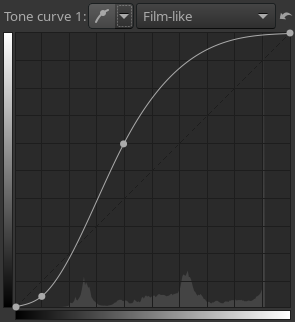 While you are free to use only one tone curve to make your adjustments, you can gain much finer tonal control if you use two curves at once. The typical use of both curves is to lower values using the first curve, and to raise values using the second one. It is similar to creating an S curve in one of them, but you should be able to make finer adjustments by using both without entering too fast in the "danger zone" where your colors becomes unrealistic. You can save a curve to disk. Click on the Save current curve button next to the graph and give it a name. Use the Load a curve from file button to apply this curve later to another file. Use the Reset curve to linear button to delete all the points you created and to reset the curve to neutral/linear. You can also Copy and Paste curves to/from RawTherapee's own clipboard, which comes in very useful if you want to quickly apply an identical curve to a different tool. Saved curves have the .rtc filename extension. You can use as many control points in a curve as you like. You can define different curves for all curve types if you like, but only the one that is selected in the dropdown menu will be applied to the photo. The curve and histogram is always displayed with sRGB gamma, regardless of working or output profile. This means that the shadow range is expanded and highlights compressed to better match human perception. This represents the unaltered (or linear) image, so without any tone curve applied. It disables the curve. This is a classic cubic spline curve, seen in many other programs as well. The left part of the graph represents the darker tones, the right part represents the brighter tones of the photo. Click on the curve to mark a point and drag it with the mouse to change tonalities. Dragging the point down makes the image darker, while pushing it up makes it brighter. The dotted diagonal line marks the linear or unaltered state of the photo. Press and hold the Control key to slow down the movement. Hold the Shift key to snap the point to key elements: maximum value, minimum value, middle value (i.e. snapped to the diagonal or horizontal dotted line), same value of the preceding point, same value of the next point, and for the Control Cage type, the line going through the previous and next points. Delete a point on the curve by dragging it out of the editor area. The top-right point represents the brightest areas in the photo. Drag that point vertically down to make the highlights less bright; move it horizontally to the left to make bright areas brighter, perhaps at the cost of some overexposure. The bottom-left point represents the darkest areas in the photo. Move that point horizontally to the right to make the photo darker, perhaps at the cost of some underexposure. Move it vertically up to make the darks lighter. Flip the diagonal line (from bottom-left and top-right to top-left and bottom-right) to produce a negative image. A typical usage of the standard curve is to construct a so-called S-curve. Mark three points at the 'coordinates' (1,1), (2,2) and (3,3) respectively. Drag the point at (1,1) somewhat lower and the point at (3,3) a bit higher. Your image will get more 'punch' this way. If your S-curve is symmetrical, i.e. if you move the point you first placed at 1,1 by the same amount as the one you placed at 3,3 but in the opposite direction, then the effect will be identical to manipulating the Contrast slider. A characteristic of the "Standard" cubic spline curve is that editing one node could have a huge impact on what happens to the curve in relation to the other nodes. The "Flexible" centripetal Catmull–Rom spline curve allows you to make adjustments to any part of the curve with little impact on the other parts. This curve presents four sliders and three control points. The sliders are used to control highlights, lights, darks and shadows respectively (shadows mean deep darks here). 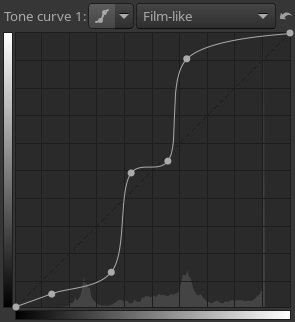 Move the mouse over the four sliders and a dark area under the curve tells you which slider alters what part of the curve. Move the Highlights slider to the left to make highlights less bright, move it to the right to make them brighter. The Lights slider moves the lights but not the highlights in the same way as above, as does the Darks slider: moving it to the right lightens the dark tones, moving it to the left darkens them. The Shadows slider works as the Darks slider, but only on the darkest parts of the photo. You can again construct the above mentioned stylized S-curve, although the parametric curve gives you less 'extreme' control over the form of the curve. This mode, however, has its own benefits, as curves can be shaped in a well controlled manner. Note that using these sliders can have a profound influence on the overall contrast of the image. Use, if needed, the three control points under the curve. They determine what point of the curve will be affected when moving the sliders. Moving the middle control point to the right makes the image darker (the form of the curve changes again, as does the dark area around the curve), moving it to the left makes the image brighter. Moving the left control point to the right darkens the dark areas somewhat, moving it to the left lightens them, again somewhat. Moving the right control point to the right makes the highlights brighter, moving it to the left darkens the highlights. Use the Reset to default buttons next to the sliders to reset individual sliders, use the same button at the top of the tone curve section to reset all four sliders and the control points to linear (zero). At first sight this curve type looks very much like the Standard curve, but there are some differences though. With the Standard curve, the curve touches all the control points. This is not the case with the Control Cage curve. To see this, click somewhere on the line and move the black point to the left or to the right. Now the curve passes nearby the black point, but doesn't touch it. Another difference is that the Control Cage allows for a straight section of the curve, while you can't do this with the Standard curve. The Control Cage curve needs at least three points for that (so five in total). Holding down the Shift key while dragging a point will help you to easily create a straight line by snapping the point to the line made by the previous and next point (displayed in red by the Snap to tool). Now make a new point between the two most left ones and move it. As you can see, only the part on the left side moves, not the rest of the curve. Next to each curve type, you'll find a Curve Mode combobox selector. This will let you choose the algorithm that will be used for the corresponding curve. The curve mode will have a strong effect on the appearance of colors, especially if you use a contrast-enhancing curve (S-curve). This can be used for creative effect, but can for some purposes or styles cause undesired color changes depending which mode you choose. Choose a mode that suits your specific taste and needs for the photo at hand. 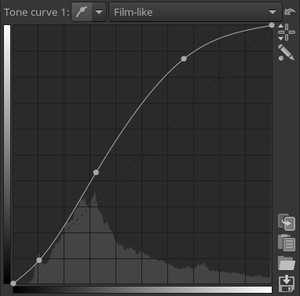 By combining two different curves in tone curve 1 and 2 you can further fine-tune the look. The choice of working profile has an influence on the effect of the curves in all modes except for perceptual - in that mode, changing the working profile will not alter the effect of the curve. This is the most basic mode (and the only one available in older versions of RawTherapee and is found in some shape or form in most image-related software): the values of each RGB channel are modified by the curve in a basic "correspondence" method, that is the same curve is applied to all channels. The drawback of this mode is that e.g. considering an S-curve shape to get more contrast, an orange color with a high value of red and green and a low value of blue will tend to shift toward yellow, because the red and green component will be raised, while the blue one will be lowered. In general an S-curve will increase separation of the channels and thus increase saturation, which is a similar behavior to how color film reacts to contrast. This together with the simplicity of implementation has made the curve type popular in raw converters in general and is often the only alternative available in less flexible software. You can use this method to limit the color shift of the standard curve, even if it won't suppress it entirely. Keeping the previous example, this method will raise the first component (red), and will also linearly alter the green and blue component by raising them too. We end up with 3 values (R, g and b) while we have only processed the red component. This process is then done for the green and blue component, so at the end of the process, we end up with 9 values (R,g,b / r,G,b / r,g,B). Values of the same component are then mixed together, which will produce the resulting color with a smaller color shift. The film-like curve provides a result highly similar to the standard type (that is strong saturation increase with increased contrast), but the RGB-HSV hue is kept constant - that is, there are less color-shift problems. 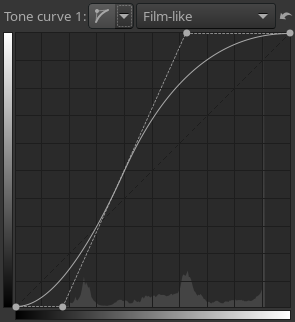 This curve type was designed by Adobe as a part of DNG and is thus the one used by Adobe Camera Raw and Lightroom. This mode is typically better suited for high-key shots, but can be used for creative effect in other photos as well. The average value of the three component is computed, and then the curve is applied to this value, giving a positive or negative gain. The color is converted to its Hue, Saturation and Value representation, then if the gain is positive, the pixel is linearly targeting Value = 1 and Saturation = 0, the Hue is preserved. If the gain is negative, the pixel is linearly targeting Value = 0, Saturation and Hue are preserved. The result is highly similar to a luminance curve in Lab space (that is change contrast without affecting hue or saturation). For contrast-increasing curves the look will typically be slightly desaturated. This is not really because the curve desaturates the colors but because that in human vision contrast and saturation is tightly coupled, so the same image with higher contrast requires higher saturation to appear to have the same. Each component of the pixel is boosted by the same factor so color and saturation is kept stable, that is the result is very true to the original color. However contrast-increasing curves can still lead to a slightly desaturated look for the same reason as described for the Saturation and Value Blending curve mode. If you want to manually counter-act the desaturation, using the L*a*b* Chromaticity slider is a more neutral way of compensating for it than using the RGB-based saturation slider. Despite showing the R, G and B histogram (merged) in the background of the curve, the curve operates on luminance values, where Relative Luminance Y = R*0.2126729 + G*0.7151521 + B*0.0721750 First the relative luminance value of a pixel is obtained, then the curve is applied to that value, the multiplication factor between before and after luminance is calculated, and then this factor is applied to each R, G and B component. This is in contrast to the other methods where the curve is applied to each R, G and B component separately. This mode will keep the original color appearance concerning hue and saturation, that is if you for example apply an S-curve the image will indeed get increased contrast, but the hues will stay the same and the image doesn't look more or less saturated than the original. It's specifically useful to establish a pleasing baseline contrast without distorting the colors provided by a camera profile which doesn't apply a curve itself (if you use a third-party profile that does apply a curve it's typically already perceptually mapped with similar techniques as described here). The choice of working profile has an influence on the effect of the curves in all modes except for perceptual - in this mode, changing the working profile will not alter the effect of the curve. The algorithm works the following way: it analyses the curve to get a contrast value, which is used as base to scale chroma (saturation) such that more contrast leads to more saturation and the other way around. As contrast and saturation is tightly coupled in human vision this scaling is necessary to make saturation appear constant. There are further fine-tunings such as increase saturation more in the shadows, and less for colors that are already highly saturated, also this corresponds to human vision phenomena so the net effect it that the colors appear constant. In the extreme highlights close to the white point the algorithm blends over to white (like the standard curves) which is less true to color but more practical for real output as the brightest color of the output media (screen or paper) is white. However do keep in mind that the perceptual model is not perfect and cannot be perfect. This is only a curve, image content is not analyzed and no localized changes are made. This means for example that for an S-curve a large flat blue sky (low local contrast) may appear slightly more saturated than the original. If you want to make A/B comparisons don't compare side by side as the eye will then be confused by the two contrast levels viewed simultaneously and then saturation will not appear the same, but instead swap and let the eye adapt for a few seconds. If you want to further fine-tune the saturation manually it's generally best to use the L*a*b* chroma tools. Due to the many components in the algorithm it's considerably slower than the other curve modes so refresh rate may suffer. This page was last edited on 17 December 2018, at 15:23.